This .40 S&W ammunition is a great choice for the range that can help you save money, especially if you pick up this economical 1,000 round case containing 20 boxes of 50 rounds each. 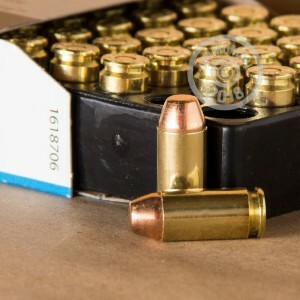 These cartridges fire a standard weight 180 grain full metal jacket bullet and serve well in a variety of pistols including M&Ps, Glocks, and XDs. 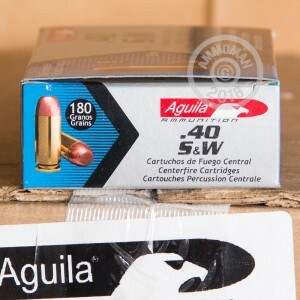 Aguila-brand ammo is brought to you by Mexican defense contractor Industrias Tecnos. IT's plant in Cuernavaca, Mexico was established with technical assistance from Remington and is one of Latin America's top producers of ammunition. 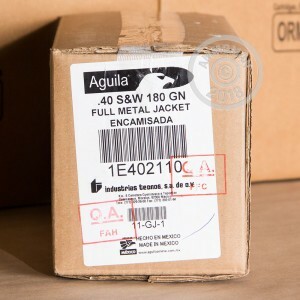 Aguila ammo uses non-corrosive Boxer primers and brass cases. Save big with case priced ammo at AmmoMan.com, where all orders over $99 ship for free! Leaves some brass in gun so you need to do a good cleaning after you go to the range. Other than that it fires good. I have put 1000 rounds through my Sig with no misfires.